When Elizabeth Gilbert decided to take a year off to retrospect on her life and ‘Eat,Pray and Love’, she chose Italy to do the eating in, and that pretty much sums it up. If you are going to eat your way to self realization , then Italian food is the way to do it. We spent a gorgeous two weeks in rome and the Mediterranean region, and this food trail is all about Rome and all the ‘cucina’ it has to offer. 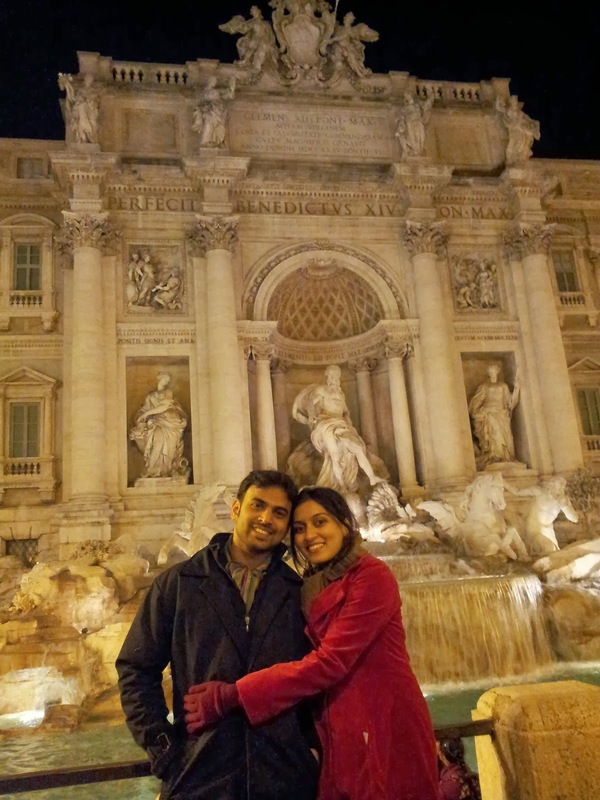 My husband and I walked the length and breadth of Rome in search of quaint churches with exquisite art and little trattorias and osterias which served great food. We pretty much ate our way through the streets of Rome. Here I have compiled our favourite 3 places for pizzas, pastas, and gelatos. No food is more universal than a Pizza, It is available in almost every single part of the world. Before Rome we had had our fair share of Pizzas, whether the Dominoes home deliveries, or the pizza hut take away, or the more upscale Italian restaurants which boasted the ‘wood fired pizzas’, but the Pizzas in Rome were a revelation. 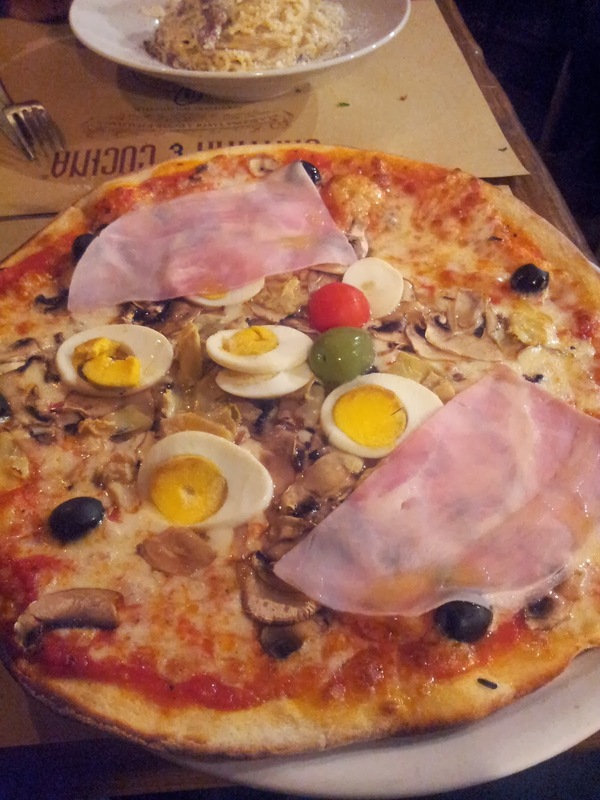 First, the Italians atleast the ones in Rome like their Pizza with a lovely fluffy dough. I loved that!! In all the snooty ‘Italian restaurants in India, especially the ones in 5 star restaurants they will serve you Pizzas which are no more than crisp flat rotis and look down at us commoners who much preferred the substantial dough of Dominoes fast food. Secondly, there are electric oven Pizzas and wood fired pizzas, the wood fire ovens are allowed to be lit only after 7 pm Rome, so if someone is offering wood fired pizzas for lunch, they either they are lying or operating an illegal wood fire oven. Oops! Thirdly, Pizzas can come as by the slice pizzas, or round pizzas, the advantage with the sliced Pizza is that you can have a pretty small slice and they charge you by the weight. But, the most eye opening were the topping! Pizza was always the champion of ‘junk food’ or ‘fast food’, but here in Rome it is just food, it is something the people eat almost every day, especially the working people who slip down to the nearest Tabachchi for a slice Pizza. So the toppings were always fresh seasonal toppings. 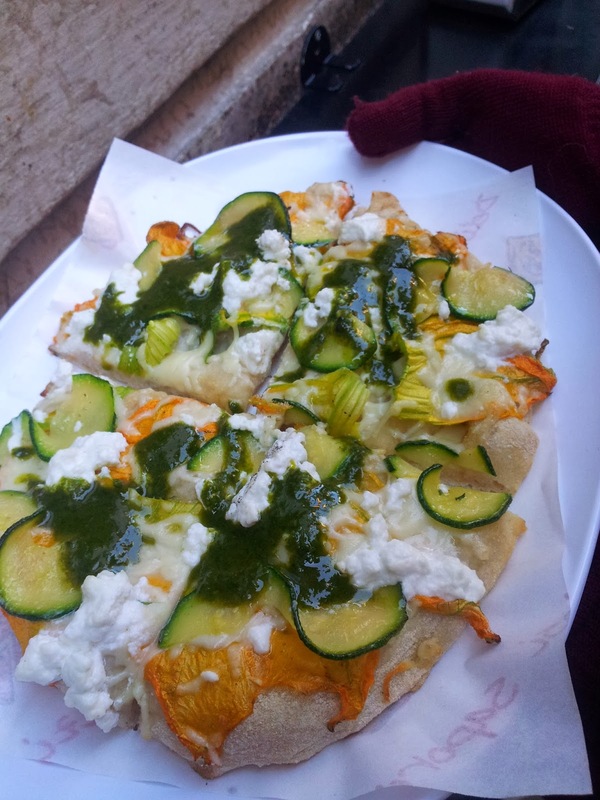 We hadsome weird and wonderful toppings such as a cabbage and broccoli pizza, a cabbage and prawn pizza, and one with zucchini flowers and slices zuchchinis. 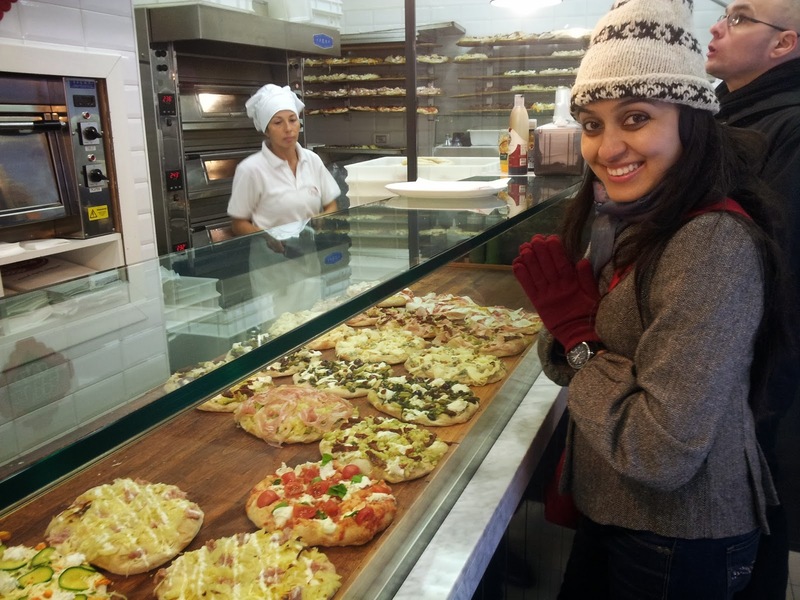 Our favourite pizza places in Rome ? 1. Pinsere Roma: This little hole in the wall place serves pizzas only, and is open from 9 am to 4 pm. Most of the places in rome had wonderful touristy atmosphere and Christmas decorations, but not this place. This place is all about functionality and the only accessory that the pizza place had was the smiles on the servers faces. There are no tables and most people just eat out on the street or take away their pizzas. This place was also the number one pizza place in Rome according to trip advisor, and the number 2 place to eat according to trip advisor. We ate pizzas every single day of our trip to Rome and we finally agreed that this truly was the best that we had had. Great value for money, fresh ingredients, exotic combination of toppings, and the most amazing pizza base. The base was crisp at the bottom and light airy and fluffy, they had large air pockets throughout, making it seem like biting into a pillow with a crisp bottom. It’s on Via Flavia road near hotel Medici. Take the train to termini and walk. 2. 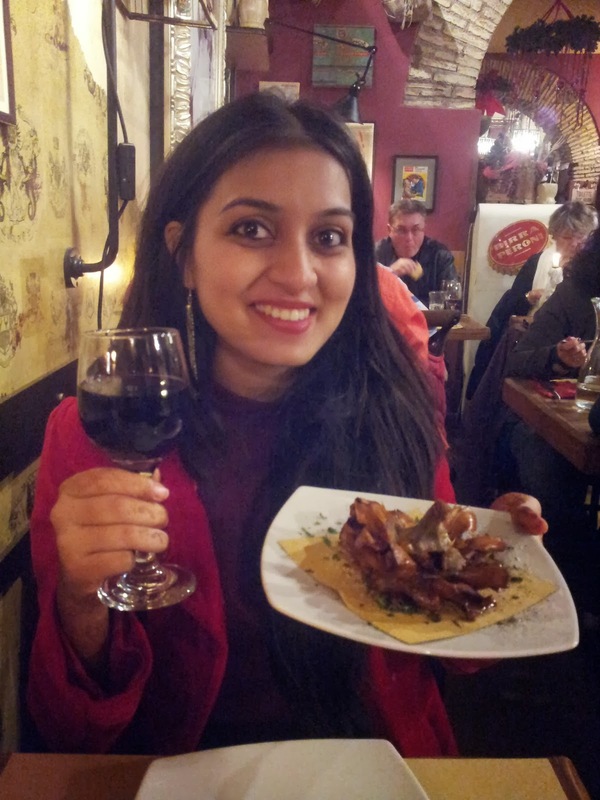 Cantina e cucina: Located near Piazza Navona ,this place was a real find. We were actually searching for a particular restaurant for dinner, but because of the many little streets around the piazza , we found ourselves walking in circles and crossing this restaurant many times during our fervent search. Now there are 3 golden rules to eating in Rome (or any place for that matter): first, always go to a place filled with other patrons especially if they are local patrons. Secondly, never go to a place where they are standing outside trying to lure you into the restaurant. Thirdly, veer clear of places situated very close to tourist destinations like trevi fountain, the Spanish steps or the piazza Navona. It’s advisable to walk into the little alleyways a bit further away from the main sight of attraction because that is where the real gems of restaurants lie. Cantina e cucina had extremely friendly staff , who not only tried to invite us into their restaurant, but even after we rebuffed them thrice and only went in after we were totally lost, we were served with smiles. 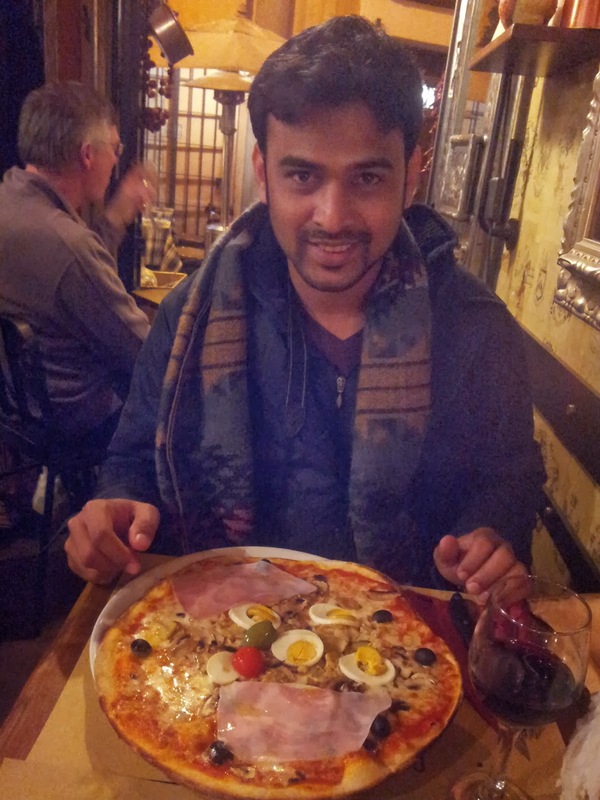 The food was great, the décor of the place had a lovely warm glow, and the pizza was hearty as well as tasty. The best part, it tasted even better the next day, straight out of the hotel refrigerator. It’s on Via del governo vecchio. 3. La renella: We went to this place as part of our twilight trastevere food tour by eating Italy food tours. The highlight was the visit to the kitchen and the Pizza ovens. Not only do they have wood fired pizzas but they have hazelnut shell fired pizzas. The hazelnut shells provide a mild nutty aroma to the base as well as there is reduce ash formation by burning hazelnut. Frequented by local Italians for their Pizzas as well as their breads this place is an institution in itself. Italian food and pasta are almost synonymous to each other, and the varied shapes and sizes are mind boggling , but the consistency of all the pastas are the same, ‘al dente’, meaning they should be firm and have a bite to them. Our food tour guide Sarah told us that the reason that Italians have mounds of pasta and still stay thin is because they prefer al dente pasta, and the more al dente ,the more healthy it is. Personally I preferred the soft and tender pasta, more in consistency to the Chinese noodles. Here is the lowdown on some of the best pasta we had. 1. Osteria del sostegno: So basically there are three typical Italian pastas that you just must try when in Rome, and those are carbonara, amitriciana and cacio pepe pasta . Cacio pepe, is supposed to be the simplest of theses three pastas, but it was the most tasty. Spaghetti, pecorino and pepper. And this place osteria del sostegno made it beautifully. This place is near the pantheon, and we managed a table here on our last day in Rome, even though we didn’t have a reservation. Tiny place but makes a number of great Italian food. No pizzas served here though. 2. Taverna del Seminario: We ordered the fixed meal plan here and that entails a primi, a secondi and a dessert. So that’s a pasta dish, a protein dish and the dessert. We had free wifi and plenty of time on our hands, which is a good thing because the servings were enormous. I ordered the Amitriciana this time and I loved it. Maybe because I love my tomatoes, and tomato and pasta is my favourite combination. This place is also the best place for tiramisu. Ahhh what I wouldn’t give to have another bite of that bitter sweet melt-in-your-mouth tiramisu! 3. Annicinquanta: Now I know I should have been writing about the best carbonara, but frankly I didn’t like any. We tried it at a number of places until I gave up on my quest . They were either too heavy or too dry for my taste. So here is a great place for Gnochi. This place is packed with locals, and we looked very out of place. 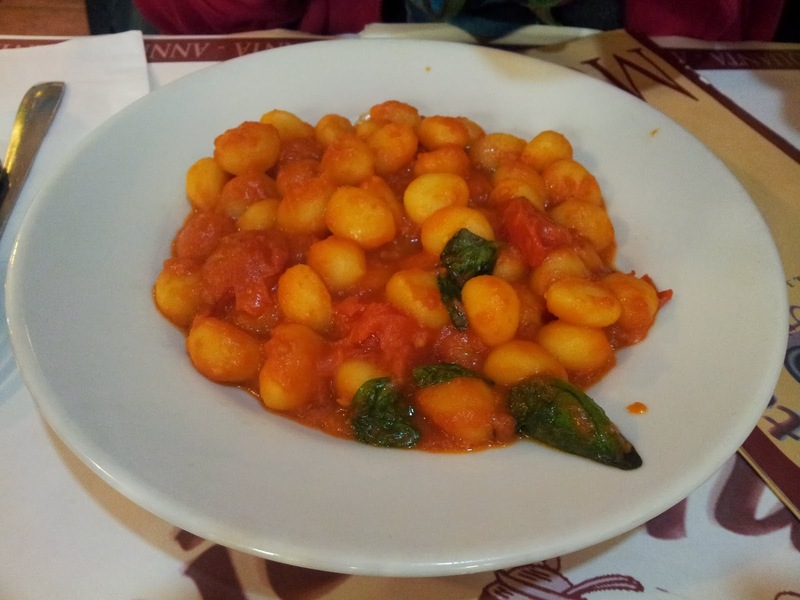 The waiters do not understand anything but Italian.But the other patrons were very friendly and I ordered my dish after I saw one of the patrons, making sounds of appreciation as he ate his gnocchi. Go for lunch here and maybe you can try their buffet too which looked very appetizing. Italians are crazy for their gelato. Even in the middle of December, people ate their double scoop gelato in their overcoats, and woolen caps. 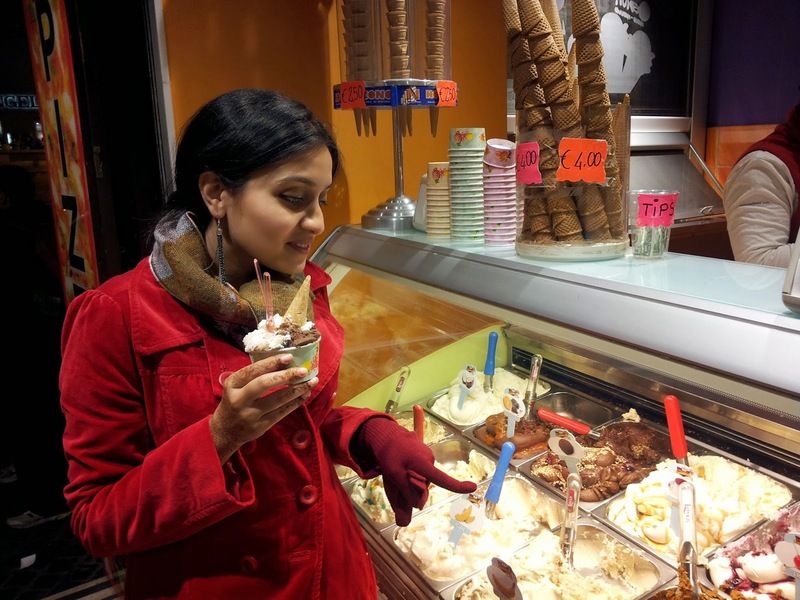 We pretty much did what the romans did, ate gelato twice a day. Gelato is made from milk, as opposed to icecreams which are made from cream, so gelatoes are supposed to be more dense and with fewer ice crystals, making them more silky in texture. Whatever the difference between icecream and Gelato, the more important question is how do you recognize authentic Gelato. Authentic Gelato, will not have artificial colouring, so mint flavor will be white in colour, and pista gelato will be a pale green as opposed to bright green. The gelato will be dense and not fluffy and copious mounds. 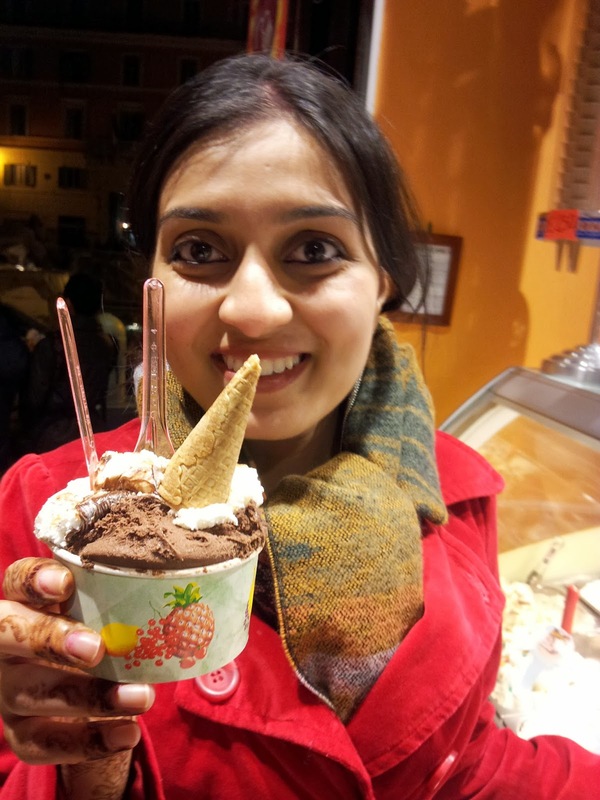 From these one thing is for sure , the gelatoes I have had in India, were definitely fakes. We went around Rome, identifying the real and the not so real. 1. Hedera: This tiny place is immensely missable, because it is so small, but search it out, in the Vatican area. It’s rated high and rightly so, because they make the most authentic gelatoes we had. They don’t have a hundred flavours unlike a few places, they don’t even have their gelatos on display in appetizing containers, infact some of them had lids on them, but pista and hazelnut combination was bang on. 2. Gelateria Giolitti: this place is always teeming with people. Their helpings are huge, flavours exciting and after the customary two scoops, you get a choice of whipped cream topping absolutely free. The Christmas cheer was apparent in this lovely tourist friendly place. 3. 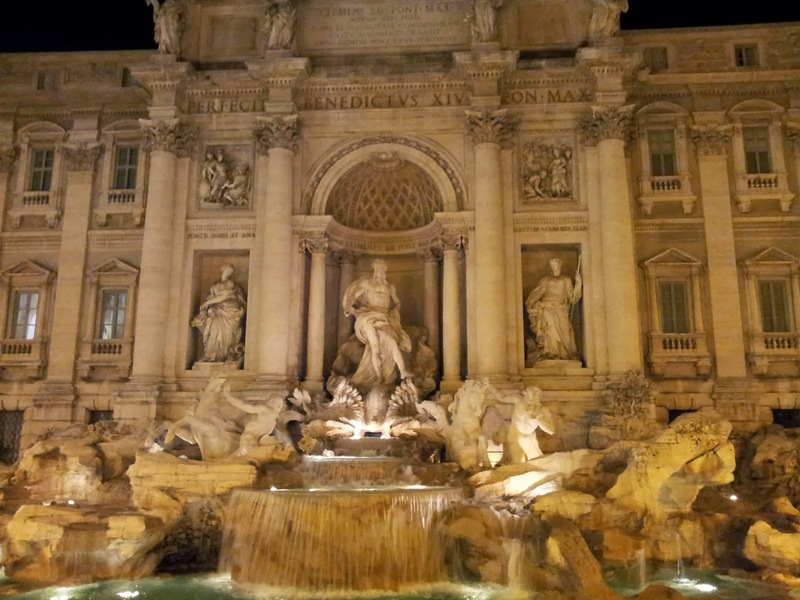 That place near the Trevi: There is a gelato place, at the fonana di trevi, on the left of the fountain, as you face the fountain. This place had Good gelato , made great by its location. It was named ‘Gelateria’ and had great big helpings of gelato, but the best thing was that you could buy your Gelato and eat it while gazing at the trevi amongst the buzzing crowd. The true ‘la dolce vita ‘ feeling of contentment. Cold gelato, crisp cone, a gorgeous work of art to gaze at , and people young and old laughing making wishes and throwing coins with gay abandon. Ah this is the sweet sweet life! we hope you enjoyed our Italian food rail, as much as we did!